The CO2 laser is the ‘gold standard’ of laser resurfacing to treat pigmentation, fine lines, deep wrinkles, skin sagging, textural irregularities, acne scarring (mild and severe) and severely sun damaged skin mainly for the face in ONE treatment. Cost: Full face C02 treatment $4000 includes post treatment pack, Synergie Skin daily cosmeceutical kit, pre and post treatment reviews by Dr Alexander. Other areas are possible and prices available upon consultation. 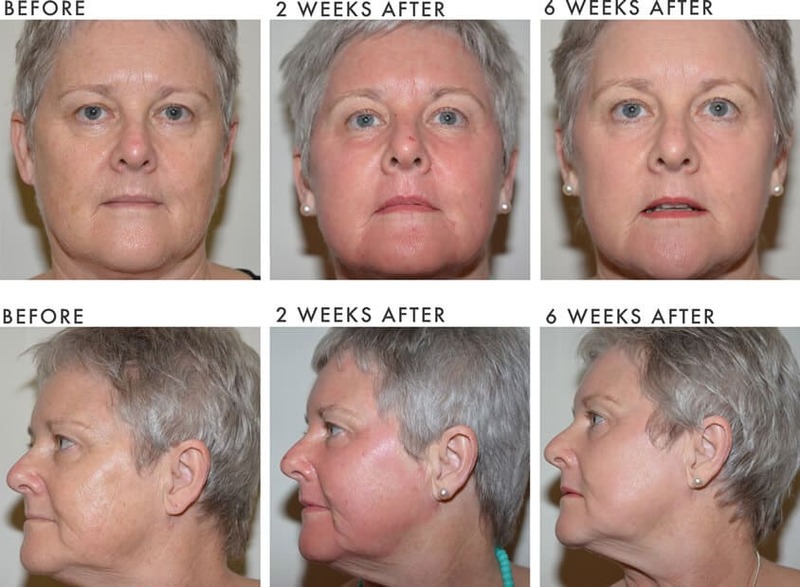 HOW DOES A FRACTIONAL CO2 LASER WORK? A CO2 Laser uses tiny laser beams to treat thousands of pinpoint areas of your skin. The laser beams focus on the water in your skin and ablate tiny columns in your skin to a very precise depth. The surrounding unaffected skin is then able to promote rapid healing. WHAT KIND OF FRACTIONAL LASERS ARE USED AT VAMP? Here at Vamp Cosmetic Clinic I use a CO2RE Laser by Syneron Candela. A CO2RE Laser treatment is generally a one off treatment for skin rejuvenation which addresses all of the above skin concerns, without having to have multiple treatments with various other machines. The CO2RE laser has the ability to combine a superficial skin treatment for resurfacing purposes, and also penetrate deep into the dermal layer of the skin to promote new collagen formation all with a single pass of the laser. The CO2RE also has the ability to perform non fractional fully ablative treatments for more severe scars and deeper wrinkles. At Vamp Cosmetic Clinic, the CO2RE laser treatment is a medical procedure performed by Dr Jacob Alexander, a fully qualified and experienced physician as a day surgery procedure. A CO2RE treatment is certainly not a “no downtime” treatment. Depending on how aggressive a treatment is, it can take from 7-14 days for the skin to heal, and there can be some redness of the skin for up to 6 weeks and even up to 12 weeks depending on how aggressive a treatment is. This can easily be camouflaged with makeup. It is important that you strictly adhere to a good skincare regime, and use a decent sunblock at least with SPF 30+, preferably an SPF 50+ sunblock, regularly for at least 1 month prior to a treatment and for at least 3 months following a treatment. I recommend that sunblock is used regularly regardless of having laser treatment or not to protect against photo-ageing and solar damage. A CO2RE treatment achieves results similar to a surgical procedure with marked improvement in the visible signs of ageing. There will be a significant reduction in pigmentation, skin laxity, fine lines, and wrinkles. After the 1st week there will be a noticeable improvement in fine lines and pigment. You will notice over the next 4-6 months more improvement with skin tightening and reduction in deeper wrinkles due to the effect from the new collagen formation (neo-collagenesis). At Vamp Cosmetic Clinic we provide topical anaesthesia as well as regional anaesthetic blocks with sedation and pain relief to ensure you are comfortable throughout the procedure. Generally over the counter analgesia is sufficient post procedurally for pain relief. IS THERE ANY SPECIFIC AFTERCARE? At Vamp Cosmetic Clinic we have a very specific and precise aftercare regime which we recommend you adhere to get the best possible results and minimize the complications. We will follow you up regularly and hold your hand throughout the healing process, and are available 24 hours a day for a 48 hours following your procedure, should you have any queries or concerns about the healing process. Most people tend to sleep for the remainder of the day following a treatment, mainly due to the sedatives used and the side effects of the pain relief used. There will be significant swelling for the first 3-4 days following treatment, and clients are advised to sleep in a semi-reclined position to allow gravity to reduce the facial swelling, and the skin will start to peel from day 2. In general peeling stops by day seven and the wounds are healed. Makeup can then be applied, and clients are then able to resume their usual activities. This is a common question we get asked about the results of laser treatments. Laser treatments are unlike other cosmetic treatments such as dermal fillers that degrade in your body over time. Laser treatments stimulate your body’s own ability to make collagen. C02 fractional lasers penetrate into the deep layers of the skin and stimulate more collagen production than other lasers, which continues up to 12 months post treatment. The results of the treatment will last as long as you look after your skin. At Vamp, we recommend a post C02 skin care regimen that will help preserve your C02 treatment for years to come. In summary a CO2RE laser treatment is a very effective medical treatment to reverse the visible signs of ageing and photo-damage with results equivalent to a surgical procedure, with significantly less cost and with much less downtime. A CO2RE laser treatment can effectively take many years off your look, providing you with a more youthful appearance.